After the excitement of the pony swim and parade we biked back to the hotel to rest and wash off all the wonderful marsh mud. We stayed at the Best Western near Assateague and rented bikes across the street. 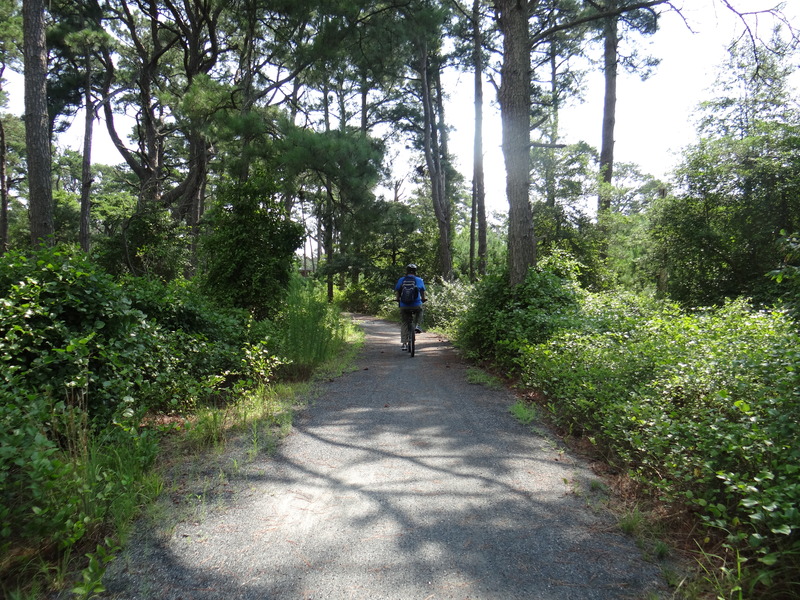 It was a great place to stay as it was close enough to bike to the Chincoteague Wildlife Refuge and Chincoteague is small enough to bike all over so we were able to park the car most of the week. The Wildlife Refuge is not only home to the herds of wild ponies but also is home to a host of deer and migratory birds like greater snow geese. “The refuge today provides habitat for waterfowl, wading birds, shorebirds, and song birds as well as other species of wildlife and plants. The refuge also provides wildlife-dependent recreational opportunities such as fishing, hunting, wildlife photography and observation, interpretation, and environmental education.” – U.S. Fish and Wildlife We always love our time exploring the refuge and enjoy the wonders of this carefully preserved treasure. Each day during the week of Pony Penning the local Island Theatre offered a showing of the 1961 movie “Misty”. There were only four human actors in the movie all of the other characters were portrayed by the actual island residents. Misty herself was paraded into the theatre for the premiere of her movie and her hoof print, signed by Marguerite Henry, still remains pressed to the sidewalk out in front of the theatre. Of course we couldn’t pass up the opportunity to see the Misty movie ON Chincoteague IN the Island Theatre. My husband is the best………. he put up with and enjoyed all of my little girl pony craziness all week. Before and after the swim you can see the ponies up close if you visit the corrals. On Assateague there are corrals and then after the swim the ponies are in a corral at the Carnival Grounds. The seasoned ponies are quite used to these round ups and do quite well in the corrals with the “All you can eat Hay Buffet”. One stallion that received many photography sessions is a stunning guy named “Surfer’s Riptide”. One can not be too certain that Riptide even has eyes with his amazing dude locks always covering them but I have seen photos that prove he does. We really enjoyed being so close to the mares, stallions and foals at the corrals. There were many sweet sleepy babies and wary stallions keeping protective watch over their families.